In 1864, a man named Gerard Adriaan Heineken bought a brewery in Amsterdam. That brewery would become the center of operations for Heineken, a well-known brand of beer. By and large, Heineken would remain a family-operated business for over a century more; in 1989, Gerard’s grandson, Alfred Henry (better known as Freddy) Heineken retired as chairman of the company’s board. Freddy’s tenure at the company was successful — he is generally credited with turning Heineken from a local brand into a global one. As part of that globalization strategy, Freddy would tour Heineken plants around the world. In 1963, for example, he was in the Caribbean, on the island of Curacao. And what he saw was poverty. So he tried to help — by turning bottles into housing. Mr. Heineken noticed that empty beer bottles were not making it back to bottlers; rather, they were ending up on beaches, as Laughing Squid recountsa brick that holds beer.” Habraken came up with the WOBO — the “World Bottle” — seen below. The bottles, either 500ml or 350ml, are stackable like bricks. Each bottle’s neck was designed to fit within a recessed area in the bottom of another bottle’s base, creating rows of glass which, when stacked and layered with a cement mixture, could form a wall. The two sizes weren’t created to meet the desires of beer drinkers, but rather the needs of architecture, with the smaller (and therefore shorter) 350ml bottles acting as half-bricks, evening out rows. Roughly 1,000 WOBOs would be enough to create a small, 10 foot by 10 foot (3m by 3m) building. If the community drank enough beer, it could build a series of tiny houses. Unfortunately, the WOBOs did not turn out to be a viable product, and despite Freddy Heineken’s best intentions, never made it past the prototype phase. 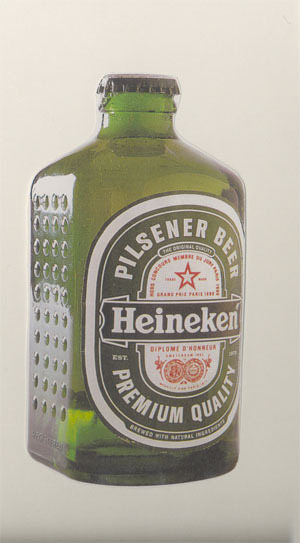 Only about 100,000 of the bottles ever existed and the vast majority were destroyed once it became clear that Heineken would not be continuing with their use. As seen here, there is a house made of them on the Heineken estate as well as a wall of WOBOs at the Heineken Experience in Amsterdam; any others are hoarded as collectors’ items. Bonus fact: Soon after Freddy Heineken turned 18, his family ended up selling much of their stake in the company, even though his father (and later Freddy himself) were board members for years after. In 1954, Freddy pulled off a coup. He borrowed money and secretly purchased, on the public markets, a large enough stake in the company to make himself the majority shareholder, bringing control back to the family. From the Archives: Power Play: How soccer can power third-world villages. Also, the bonus fact gives another great way to reuse bottles to help with third-world infrastructure.